This cassette was mentioned in the October 1990 edition of Bluegrass Unlimited, and reviewed the following February. I've not been able to find a copy, so if anyone is able to provide more details, or a scan of the cover please get in touch via the Contact page. Lester Davis Pate was from Boones Mill, in Franklin County, Va. He was born 12th Sept 1944 and died 1st June 2003 aged 58. 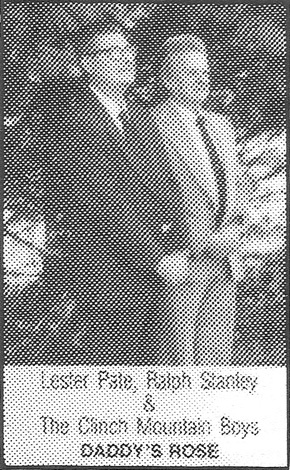 He was given a Congressional Commendation by Virginia in 2002, which tells us that he was a member of Boones Mill Town Council and an active member of the Masonic Lode and Ruritan Club. He had played banjo for 44 years, and had played with "Bill Monroe, Roni Stoneman, Lewis Family Done Reno & Red Smiley, Jim Eanes, John Conlee and Dr. Ralph Stanley, with whom he has made two recordings." The Commendation also tells us that he was made an Honorary Clinch Mountain Boy on 12th May 2001. In his obituary in 'Bluegrass Unlimited' it mentioned that Lester died at his home in Boones Mill, after a year-long fight with cancer, and made his last live appearance in Aptil 2003. The obit. adds that in the '70s he played in the 'Bluegrass Gospel Quartet' that broadcast on Blackburg's radtio station WKEX. Chris Wing tells me that the cassette was sold by County Sales, and their catalogue mentions that the cassette had a manufacturing fault. 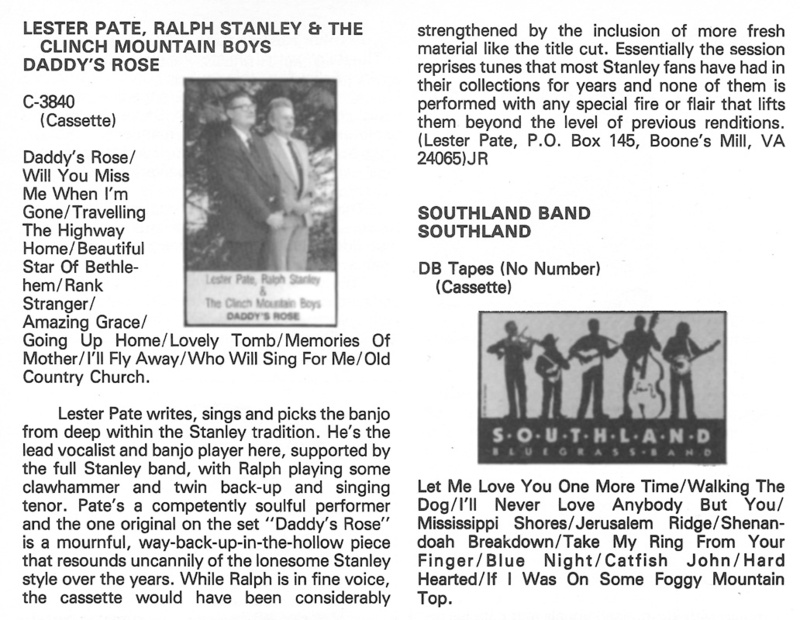 Although not mentioned in the Bluegrass Unlimited review Dady's Rose was presumably the Earl Sykes song Ralph had recently recorded on I'll Answer The Call LP/CD. I presume the Lovely Tomb title on the cover should be Hank Williams' Lonely Tombs... Curly Ray's The Old Kentucky Fox Hunter Plays Gospel has the same typo.